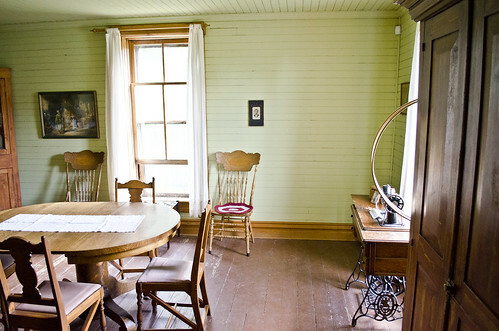 Looking from the entrance hall into the dining room on the first floor of the house on the grounds of the Tinsley Lliving Farm at the Museum of the Rockies in Bozeman, Montana. The house was constructed in 1889 by William and Lucy (Nave) Tinsley. William Tinsley worked for Wells Fargo and migrated to Montana in 1864. Lucy was a dressmaker who emigrated to Virginia City, Montana, the same year. Both were originally from Missouri. They met in Virginia City, married in 1867, and relocated to Willow Creek in the Gallatin Valley (about 40 miles west of Bozeman). They built a homestead log cabin (about the size of the current blacksmith shop), and lived there until 1889. Their first child was born in 1868, and by 1889 they had eight kids. William Tinsley built the family a two-story home out of logs taken from the nearby Tobacco Root Mountains. The oldest children helped haul the logs, which took two days to get to the homestead. The structure took two years to construct. Most of the items in the house were ordered from the Sears catalog. The family occupied the house until the 1920s. The house was purchased by the museum in 1987, and moved from its original location to the Museum of the Rockies in 1989. Refurbished with items donated by Tinsley descendants, it now serves as a living history museum. The house sits on 10 acres of land, and includes a historically accurate kitchen garden, flower garden, chicken coop, farm implements, carriage house, blacksmith shop, root cellar, outhouse, functioning well and pump, storage shed, and fields. A full cellar was excavated beneath Tinsley House as well. Visitors are free to touch and use many of the items in Tinsley House. A staff of historical re-enactors includes four women who cook, clean, sew, and perform chores around the house as well as a blacksmith who does ironmongery and repairs.